Earlier this week Roar from 34 highlighted Frank Robinson’s upcoming role as grand marshal of the Cincinnati Reds’ traditional Opening Day parade. Towns like Cincinnati and St. Louis still hold such festivities when the baseball season opens, just as the International League Orioles did in the late-1890’s and early-1900’s. 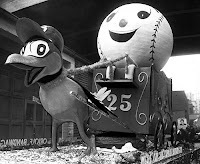 However, one of the more famous Oriole parades occurred in 1954 when the relocated and renamed St. Louis Browns opened the modern baseball era in Baltimore. On April 15, 1954, 22 bands and 33 floats wound their way from Camden Station, where the team arrived after having played in Detroit, through downtown Baltimore during a 90-minute parade before 350,000 enthusiastic locals that ended on 33rd Street, where the Orioles defeated the Chicago White Sox 3-1 in front of 46,354 lucky ticketholders. Baltimore native Joe Jerardi described the festive atmosphere that permeated the city that day during a 2004 interview with the York Daily Record. “The day the Orioles arrived in Baltimore, trolleys clanged down cobbled streets. Kids rushed to see Pinocchio at the Hippodrome. Banana boats dumped their bushels onto weathered wharves where the Inner Harbor now stands. On April 15, 1954, Baltimore had no Beltway, no Harbor Tunnel, no Jones Falls Expressway. Working farms still prospered inside the city; ditto, a row of bustling department stores. Nationally, April was a month of firsts. Hank Aaron hit his first home run. Elvis cut his first single. America suffered its first casualty in Indochina. But in Baltimore, the focus was on its new big league baseball team, a group of exiles from the Midwest hitting town for their first home game. At Camden Station, the Orioles – having traveled from Detroit, where they split their first two games – stepped off the train and into Oz. Lampooned for years in St. Louis, the players paraded through the streets of Baltimore, flanked by brass bands and beauty queens and hailed by a crowd of 350,000 – more than had attended all of the Browns’ home games in 1953. People lined Charles, Madison and Howard streets, and hung from trees and fire escapes in a cold drizzle to watch their team, a caravan of .250 hitters and journeyman pitchers. Perched atop the back seats of cream-colored convertibles, players lobbed plastic baseballs – 20,000 of them – to the slew of school kids given the day off. Five thousand Hawaiian orchids were strewn along the 3 1/2 -mile parade route, ahead of the Orioles’ entourage, though many spectators darted between cars and scooped up the flowers to use as corsages. What last-place club rates a salute of 22 bands and 33 floats? Army bugles, Scottish bagpipes and German oom-pahs led the Orioles downtown. A 14-foot papier-mache statue of Babe Ruth sprouted from one float; the reigning Miss America waved from another. One crowd-pleaser featured a mechanical oriole chirping as her brood hatched from a huge, baseball-shaped egg. Next came Bozo, a live spider monkey dressed in an Orioles uniform, riding the back of a long-legged whippet. The 1954 Orioles finished their inaugural season with a record of 54-100, good (loosely speaking) for seventh place in the eight-team American League, a mere 57 games behind the first-place Cleveland Indians. The only O’s players to lead the league in any category that season were Don Larsen, who piled up 21 league-leading losses two years before throwing a perfect game in the World Series, and Don Turley, who paired the most strikeouts (185) with the most walks (181) on his way to a 14-15 record. Visit Flickr for another picture from the 1954 Opening Day Parade. The photo above comes from The Sun and is linked accordingly. My mother was on her own float in the 1954 Oriole parade. Her name was Mildred Stockslager. How can I find a picture of her on this float? She said she had a choice to be on a float with other ladies or have her own. She choose her own. That's great. Thanks for the comment, Karen. You might try contacting the Baltimore Sun regarding parade photos. Perhaps they have more in their archives.